Welcome back after a short (but highly rated) break over the school holidays! 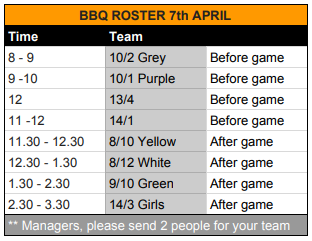 Team Managers, please be aware of filling out team sheets correctly (u11 & above teams only). We will be fined for mistakes. Check in with the Ground Official on the day for assistance and an autograph (every team sheet requires it). Dont forget to have a Marshall allocated and signed on also! Still unsure, would like more help?? NFA have a YouTube clip on it!! - To keep up with game times, download mygameguru or regularly check the NFA website (click on competitions, fixtures). You can also see this week's draw here. - Remember home teams are required to help with setting up and packing away playing field equipment, as well as taking a turn on the BBQ. Please check the roster. - The clubhouse will be open this Wednesday, 4th April, from 4.30pm to 5.30pm for sock and short purchases. Its best if you can make your purchases before the weekend. - Remember we are all volunteers, this is grass roots soccer, and the referees are human. Have fun, enjoy watching and leave the coaching to the coaches. If something comes up that does concern you, let your team marshall know, or approach the ground official on the day. There is probably more, no doubt we'll figure it out on the way. Enjoy your first round of winter soccer! All Mens teams are now moved to Glenbrook Oval (Moore Street, next to Skate Park). Game times remain the same. Trial Games scheduled for this weekend (24th and 25th March) are not cancelled at the moment. Please wait for updates on games being re-scheduled to other grounds!